Spain has one of the most colorful cultures in the world. There are many reasons for visiting this wonderful country. While many tourists flock here for sunny beaches and historical cities, they soon learn that there is much more to see and learn about. Soap making, for instance, has flourished in this country for centuries. In fact, one of the most popular types of soap in the world, Castile soap, is named for the region of Spain where it originated. Spain traditional of making soap has also led to several Spanish brands becoming famous globally for their quality bath products. Castile Soap is a huge part of the history of soap making in Spain, and even in entire Europe. It is a big part of Aleppo’s expansion – a very essential cleaning product in the world. When Aleppo soap entered Europe, public sanitation and hygiene were revolutionized (thanks to the rampant spread of diseases). This resulted in the creation of Castile soap. Castile soap became so popular because the city had a lot of olive oil – which was vital in creating high-quality soap. Although the original soap recipe required laurel oil, they replaced it with olive oil because of dwindling supplies. Olive oil allowed makers to create pure white soap, which was super gentle and mild. To this day, Castile soap continues to represent one of the most ecological and pure forms of soap, which is handcrafted. Castile soap is amazing for washing the body and hair, as well as laundry. It is safe for all skin types – even for kids. Kirk’s Original Coco Castile Bar Soap is a good example of Spain’s impact on the global market. Castile soap was now being created in different countries, not just Spain, leading to worldwide popularity for this high-quality soap. Isla de La Toja, found in northwestern Spain, is a very famous island because it is a thermal center. It has thermal hot springs, which locals and tourists utilize for its medicinal water and thermal mud – even to this day. The only difference since it was discovered in the 19th century is the commercialization of the island with spas and resorts. There are also many soap and cosmetic factories. The thermal springs are renowned globally for their dermatological and health benefits. Mineral salts were extracted from these waters – and then incorporated into the products we love today. This is one of La Toja’s most distinguishable properties found in its products. 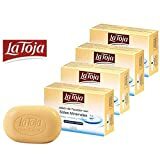 The La Toja Bar Soap with Mineral Salts is a perfect example of a soap product containing curative and healing properties on top of the cleansing it can provide. Heno de Pravia is a very popular brand, not only in Spain but worldwide. The brand creates soaps and other personal care products. Salvador Echeandia – a co-founder of Perfumeria Gal – dropped by Pravia, and was blown away by the smell of freshly cut hay. He saw farmers cutting hay and grass for their animals. He fell in love with the scent. When he came back to Madrid, he did his best to recreate this aroma and mixed it with ingredients: lavender, geranium, and sandalwood. It has a green color, wrapped in yellow packaging, to symbolize the color of heno (hay) as it dries. 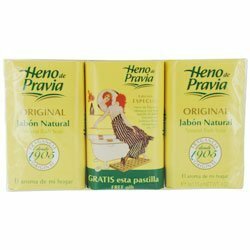 Here is their signature product: Heno de Pravia Natural Bath Soap. It still is one of the most popular soaps all over the world. Myrurgia was founded in Barcelona in 1916. The name comes from a Greek word that means “essence” and “industry”. Combining the proper chemical engineering, marketing, and artistry of the family who owns the brand, the company became a very successful name to this day. They produce exquisite soaps, fragrances, and other personal care products. A great example of this quality is the famous Maja By Myrurgia For Women. Magno Soap has been replicated over and over in different countries, because of its amazing qualities. It is somewhat impossible to describe the fragrance of this soap. It is earthy, natural and woodsy, and everyone can use it – men, women, and even kids. There are even Magno Soap superfans that would swear that they will not use any other kind of soap. These are people who have used this soap since the 1950s. They tell stories about the difficulty of finding any soap in Spain, and when they stayed in hotels, only Magno Soap was available. The soap has a black color when dry, but when used, the soap creates a rich white and frothy lather. The soap has a glycerin base and special thermal salts. 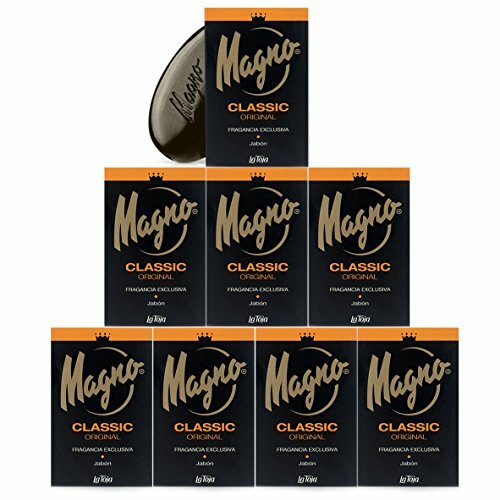 Together with other ingredients, Magno soap keeps its uniqueness and originality when compared with other European and global brands. 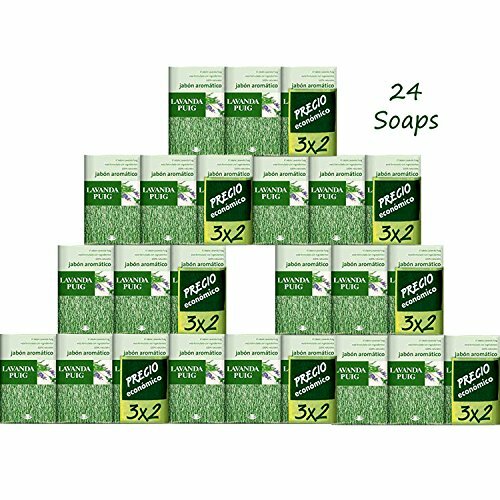 Magno Soap is available in the classic soap bar form, as well as in shower gel bottles. Puig is a family-owned fragrance company. Today, the third generation of fragrance makers are managing the brand. It is a leading company in the creation of various fragrance products, based in Barcelona. They have many offerings, but one that stands the test of time – and an ultimately positively reviewed product – is the Agua Lavanda Puig. It is rare to find lavender colognes and waters today, and it is one that still is produced now. The product features a straightforward lavender fragrance. As a quick mental picture: when you use this product, you would immediately be reminded of men from the 1940s to 1960s. It’s not outdated, but it has a really classic, classy feel to it. It’s not a grandpa scent, but it’s super elegant and clean. The Agua Lavanda Puig Bath Soap is also available in other forms: such as shower gels, body milk, dry splash, and fragrances that are available in both glass and plastic bottle packaging. There’s so much more to soap making history in the world. Check out our other history posts. Learn more about French soaps, Portuguese soaps, and Moroccan soaps. Discover how the leading brands have changed the way soaps are made in different countries across the globe.